The fourth candidate on our slate of top-tier women running for president has announced! 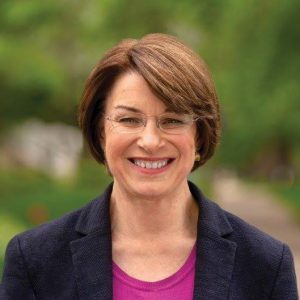 Sen. Amy Klobuchar made it official today in Minneapolis, becoming the ninth major Democratic candidate to officially declare a presidential candidacy or exploratory committee. Entering the fray to become the first female president isn’t completely new territory for Sen. Klobuchar: When Minnesotans made her their US Senator in 2006, she was the first woman elected to the job. Prior to that she was the lead attorney for Hennepin County, Minnesota’s most populous county. That background was on display during her tough questioning of Brett Kavanaugh, and when she co-sponsored recent legislation to tackle sexual harassment in Congress. Welcome her to the race: Chip in $20 to her by giving to our Get Them on The Stage slate. And support the other three women too. It’s historic to have this many women considered credible candidates, and we want them to be competitive when they go head to head with the men on that debate stage in June.